Steel industry in general, produces large amounts of solid wastes while processing materials through its various processes. These solid wastes have many valuable products, which can be reused if recovered economically. Steel industry throughout the world has already taken up a number of innovative measures and continues to take further for 100 % utilization of these wastes with the ultimate objective of improving the operational efficiency and economics of steel industry. These measures not only reduce the cost of waste disposal and environmental pollution but also provide substantial amount of iron ore and flux materials as well as fuel rate benefits to the existing process, thereby conserving matching amounts of raw materials. Steel industry is both capital and energy intensive and its production volumes are very high. Process chains within the industry are long. Many different technologies are applied and the industry has a significant impact on the environment. One of the major concerns of world steel industry is the disposal of wastes generated at various stages of processing. Because of natural drive to be cost-effective, there is a growing trend of adopting such waste recovery technologies which convert wastes into wealth, thereby treating wastes as by-products. This has led to aiming at development of zero-waste technologies. The technologies developed to economically convert wastes of steel plants into wealth also provide new business opportunities for prospective entrepreneurs. As per World Steel Association (WSA), the world steel industry applies the principles of reduction, reuse and recycling (3 ‘R’s) in many ways, in order to improve the sustainability of the industry. Due to this the industry has dramatically reduced need for raw materials. In the 1970s and 1980s, modern steel plants needed an average of 1.44 tons of raw materials to produce 1 ton of steel. With investments in research, technology improvements and good planning, the steel industry today uses only 1.15 ton of inputs to make 1 ton of steel which means a reduction of 21 %. These days a lot of overlapping exists in the interpretations of the words ‘solid wastes’ and ‘byproducts’. In fact some solid wastes in steel industry are essential by products generated during various processing of the materials in the processes involved in the production of iron and steel. For example, until the last decade, the slag, dust and sludge generated by steel industry were called solid wastes, but now this term has been replaced by byproduct for these waste materials. Due to intensive reutilization of the wastes some of the solid wastes are now increasingly being referred as ‘by-products’. As per WSA, recovered co-products (a term used interchangeably with by-products), can be recycled during the steelmaking process or sold for use by other industries. Use of co-products supports the sustainability of the steel industry. It prevents landfill waste, reduces CO2 emissions and helps preserve natural resources. The sale of co-products is also economically sustainable. It generates revenues for steel producers and forms the base of a lucrative worldwide industry. Some steel producers report a co-products utilization and recycling rate as high as 99 %. The main co-products from iron and crude steel production are slags, dusts, scrap and sludges. The disposal of solid waste generated from the steel industry processes is the major concern. Therefore, Reduce, Reuse, and Recycle (3 Rs) philosophy and efficient waste management is need to be adopted by the steel industry. The following are the major solid wastes/co products/byproducts in various production processes of steel industry. The main solid wastes generated in the production of metallurgical coke are coal dust, coke dust, tar sludge and acid sludge. Coal dust is recycled back through the coal blend. Coal dust can also be recycled along with coke dust by adding them in the sinter charge mix. Tar sludge is added to the coal blend to improve its density. Acid sludge need to be neutralized before its disposal. Solid wastes generated in the sinter making are dusts and sludges. Dusts are generated at sinter machine building floors, cyclones and ESP (Electrostatic precipitator). Sludge is generated at the clarifier of the water treatment plant. These dusts and sludges are rich in iron (Fe) and contain good amount of lime (CaO), magnesia (MgO) and carbon (C). These materials are very good materials for recycling back in sinter making. These materials are either blended with iron ore fines or briquetted for recycling. The major solid wastes generated in pellet plant are dusts and undersized green pellets. Both of these are recycled back in the pellet feed material. Dusts and burden screenings are recycled back in sinter making. Cast house runner jams are either sold as iron scrap for re-melting or recycled in the steel melting shop. Cast house muck is dumped as land fill material. Most of the BF liquid slag gets granulated and is sold to cement manufacturers for the manufacture of BF slag cement. A small amount of BF slag gets air cooled. The air cooled BF slag is either dumped as landfills or used in road repairs within the steel plant. In either case the iron contamination of the slag is separated and sold for re-melting. Flue dust and GCP dry dust (in case of dry gas cleaning) are recycled in sinter making. GCP wet sludge (in case of wet gas cleaning) from the clarifier is dried and is either blended with the iron ore fines in the raw material yard or briquetted and recycled in sinter making. Refractory waste from the ladle repair shop is sold and the same is used by the refractory manufacturer in the manufacture of mortars. HM ladle skull is broken either by dropping weight or by lancing and the broken skull is sold as iron scrap or used in steel melting shop. During the ironmaking process by direct reduction the main solid wastes are char (in case of plants using coal based technology), dusts (both coal and iron), under sized DRI (direct reduced iron) and DRI rejects. Char is used in captive power plant as fuel for the boiler. Coal and iron dusts are used in the sinter plants. Coal dust can also be used in the boiler. Iron dust can also be sold to the cement manufacturers. Under sized DRI is briquetted and used along with DRI in steel melting shop. DRI rejects are recycled back in the process. During pig casting of hot metal, waste materials like plate jam, runner jam and lime sludge get generated. Plate jam and runner jams are sold as iron scrap after processing. Lime sludge is used for neutralizing purpose. The main waste materials in the BOF steel making are converter slag, scrap, waste refractories, converter muck, and gas cleaning plant (GCP) sludge. Except GCP sludge all other waste materials are usually generated in mixed condition which means that during generation one waste material gets contaminated with other waste material. Hence sorting is a very important step for recycling of the waste materials in steel making. GCP wet sludge from the clarifier is dried and is either blended with the iron ore fines in the raw material yard or briquetted and recycled in sinter making. Converter slag after removal of scrap is recycled in the sinter mix as a replacement for limestone. Converter slag is also used in road repairs, for railway track ballast, and as soil conditioner. Scrap removed from converter slag as well as from the muck is recycled back in the converter for cooling purpose. Steel scrap also gets generated when there is ladle through or converter through though this phenomenon is very rare. From converter muck scrap and refractory wastes are removed and balance is used for land fill. Refractory wastes are usually of two types. First type is which comes out from used converter lining and mainly consists of magnesium carbon refractories. Most of these refractories which are not contaminated are used in the converter for the bottom patching. Second type is ladle refractory wastes. If these wastes are basic then they are treated similarly to converter refractory wastes. In case they are of alumina then the refractory waste is used for mortar manufacture. Main waste material in the electric steel making is EAF (electric arc furnace) GCP dust, slag, scrap and waste refractories. Magnesia carbon waste refractories are used as slag conditioner in the EAF. Electric Arc Furnace (EAF) slag owing to its high crystallinity and high iron content has presently no well established method for potential recycling. The basicity index (BI) of the slag is generally between 1.2-1.8 which comes under the low hydraulic Merwinite group. Also the Grindability Index, which is a measure for the energy required for grinding a particular material to a given size, is high due to high Iron oxide content. This makes the further grinding and processing of EAF slag energy intensive. The slag has been used as an effective aggregate for road making. Vitrified ceramic tiles have also been developed from the EAF slag. Major waste materials generated in the continuous casting process is continuous casting scale, refractory waste, scrap, slag and muck. Here also waste materials are generated in the mixed condition and sorting is needed as the first step for separating different types of wastes. Continuous casting scale is recycled in sinter plant. Scrap is recycled in the steel making. Other waste materials are used as land fill. Major solid waste materials generated in rolling mills are mill scale, refractory waste from reheating furnace, and scrap. Mill scale is recycled in sinter plant. Scrap is recycled in steel melting shop. Refractory waste depending on the condition either goes for mortar manufacture or is dumped. Solid wastes generated at the calcining plant are limestone and dolomite screenings, lime dust and lime fines. Lime dust and lime fines are briquetted and recycled either in sinter plant or steel melting shop. Limestone and dolomite screenings are recycled in the sinter plant. Major solid wastes generated at the power plant are the fly ash and bottom ash. Fly ash is utilized in the cement production. In some of the plant ash is sent to the ash pond. Ash recovered from the ash pond is utilized in raising the height of the dyke of the ash pond. Waste management of solid wastes consists of generation, prevention, characterization, monitoring, treatment, handling, reuse and residual disposition. It requires a new attitude of the employees and management. Traditional thinking places all the responsibility on a few experts who are in charge for it. The new focus is to make the waste management responsibility for every employee. 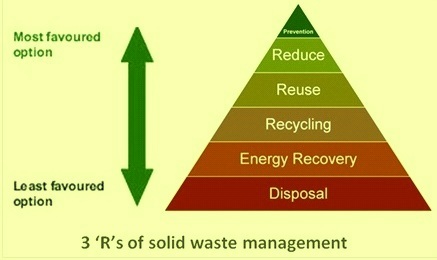 Importance of solid waste management is what the production oriented managers and workers are to learn. For effective solid waste management, their participation and cooperation is crucial. Also the commitment of management is necessary and vital for a successful waste management program. Management can demonstrate its commitment by training the employees in waste management techniques, encouraging employee’s suggestions, providing resources for the 3 Rs activities, and measuring and monitoring the waste generation and waste recycling. The ultimate goal of the management must be the zero solid waste from the plant. For this follow-up and continuous improvements are crucial. Measurement and reporting of waste reduction and achievement of cost saving goals also helpful in improving the working results and the sustained development of the steel plant.